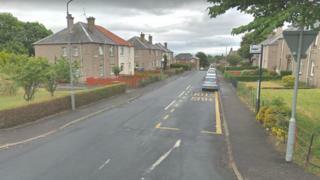 Police are investigating an assault after a man was struck with a bat in an Ayrshire garden. The 51-year-old was in a garden in Mayville Street, Stevenston at about 20:40 on Thursday when he was approached by a man and a woman. The man repeatedly hit him with the bat in what police are calling a "violent attack" before running off with the woman. The man was treated in hospital for injuries to his head and body. Det Con Bryn Meehan said: "We are trying to establish a motive for this violent assault. "At this time we have no description of the man and woman involved and I'd appeal to anyone who was in the vicinity of Mayville Street who can recall seeing a man and woman - either hanging around suspiciously prior to the assault or running off afterwards - to contact police immediately."